Provo's Renshaw: An accidental band, accidentally discovered. Friday, May 4, 8 p.m.
Before talking about music, it was necessary to ask the only truly important question: "So, are we related?" Cayson Renshaw laughs, but he already knows that's the reason his band—called Renshaw—caught my attention. It's a curiosity to find other people with your not-particularly-common name, let alone to find that someone has decided it was not particularly common enough to make it the name of a band. "The funny thing was, it wasn't my idea to name the band Renshaw," says Renshaw, the principal singer/songwriter. "When we planned to do this battle of the bands, one of the guys threw out Renshaw, and I was like, 'If you really want to.' Sometimes someone will find out I'm in a band, and they'll ask what the band's name is, and I'll say 'Renshaw.' Either they don't know what that is, or they know it's my last name, and I might get an 'Oh ...' I do have this little bit of fear, I guess, that people think I want all the credit." While perhaps evoking "named after the band leader" rock acts like Van Halen and Bon Jovi, or family groups like Hansen and Haim, Renshaw is neither. 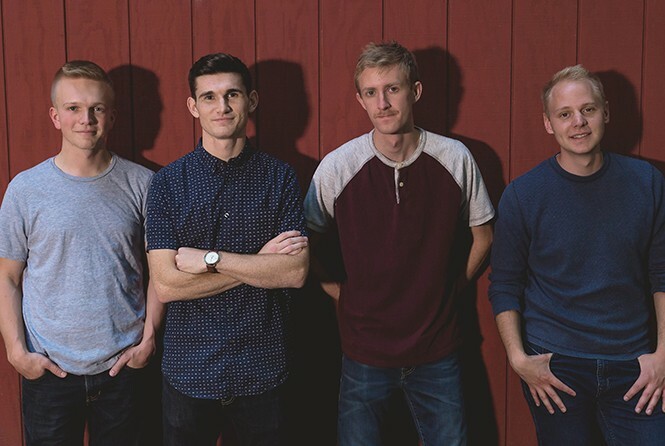 A quartet of BYU students—Renshaw, keyboardist Jarom Hansen, drummer Mitch Romney and bassist Michael VanWagoner—Renshaw plays a wholesome brand of acoustic pop, combining their own songs like the wistful romantic ballad "All My Life" with beautifully harmonized covers like Fleetwood Mac's "Landslide" showcased in a recent YouTube upload. From Renshaw's description of his own childhood interests, it's surprising that he's involved with music at all, let alone leading a band. Like many kids in Utah, he was dutifully brought to piano lessons by his mother; also like many kids in Utah, he hated it. "I was more interested in playing baseball and soccer," Renshaw says. "Then I would just kind of sing for fun, nothing special. And my parents were like, 'Hey, he's kind of good.'" That family interest in his musical ability led to another opportunity he was not too enthusiastic about: Joining his sister for a high school a cappella performance when she was a senior and he was a freshman. "I would say I was forced into it," Renshaw says, "but I ended up really enjoying it." Around that same time, he started playing guitar, and soon thereafter began writing his own songs. While he might have been a reluctant musician initially, the creative side appealed to him. "I tend to over-think life," he says. "Writing music has always been a way for me to express what I'm thinking, because I have a hard time expressing myself in any other way." In the same way that Renshaw himself is perhaps an improbable musician, the band Renshaw probably never should have existed, since its creation was based on a misunderstanding. In spring 2017, Cayson Renshaw was invited to open for musician Ben Rector when Rector was scheduled to perform at BYU. "I thought they would want me to have a band with me there," Renshaw says, "so I rounded these guys up and started jamming with them once or twice a week. But they didn't actually want me to have a band, because it was just going to be [Rector] and another guy, an acoustic thing." While the band Renshaw didn't end up opening for Rector, their practice time didn't go to waste. They applied for and played at the aforementioned battle of the bands at Velour in June 2017, and have played a few gigs since. Being full-time students, however, has limited the time available for the band to play and record together. "It is hard, especially being in school," Renshaw says, "but we are hoping to really kind of hunker down and get some stuff out this summer." Renshaw is proud of applying his faith to his music, and his upbeat messages have given him an opportunity to record songs for the LDS church's annual themed albums for their Especially for Youth program. "We feel like the music we're putting out is good," Renshaw says. "Not only sounds good, but hopefully can do some good. ... [Music] for me is hopefully a way I can connect with people and somehow impact their lives for the better. And there are cases every once in a while where I'll hear from someone that some music we did influenced them, and it's really cool to hear." Cayson Renshaw can't say whether there's a long-term future for the band Renshaw beyond college, and the members are fine with just letting it be what it is at the moment. "We have discussed a little bit about how it's difficult for me to draw a line between my personal projects and the band's music," Renshaw says, "because most of the stuff we play is music that I've written. But they obviously play a huge part in it all. I think it's different for me than it is for them, perhaps." After all, it is his name on the band. And for the record: It doesn't appear that there's any relation—just the kind of coincidence that can lead to some good music.